Welcome to our collection of beautiful vintage rugs and carpets from the rugged mountains of Morocco. Esmaili Rugs & Antiques offers a fabulous variety of exotic Moroccan rugs to complement any décor with rich textures, beautiful colors and the alluring ambiance of radiant Morocco. Appreciation for the bold, spontaneous mystique of Moroccan rugs began in earnest during the 1920s when classical architects like Breuer and Le Corbusier integrated Moroccan carpets into commercial and residential interiors. People went wild for these stunning works of art, actively seeking Moroccan rugs on sale with which to grace their homes, museums, cultural centers and high-end business buildings. Divided into several categories, Moroccan rugs on sale at Esmaili’s Rugs & Antiques reflect cultural exchanges with Mediterranean countries and were significantly influenced by Ottoman Empire design styles until the early 1900s. 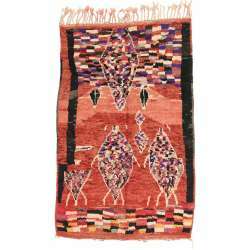 Moroccan rural rugs followed Berber traditions until later in the 20th century. Woven meticulously by the Beni Ourain from the Rif Mountains, Berber rugs present a dazzling variety of colors from neutral white, gray and brown shades to eye-popping, reds, greens and yellows. Designs found on our Moroccan rugs on sale online include geometric shapes , free-form shapes and expressive, primitivist (primitive) patterns. Antique and vintage Moroccan rugs remain wildly popular today because of their decorative versatility, pure beauty and exotic, lush appearance. We offer an exclusive selection of discounted Moroccan rugs on sale as a way of showing our appreciation to our customers and to help introduce newcomers to the world of vintage and antique rugs. When on sale, Moroccan rugs become even more attainable to people who would love to purchase a genuine Moroccan rug but aren't sure whether they would be satisfied with their investment. We can guarantee you will become an instant rug enthusiast once you bring home a gorgeous, handwoven Moroccan rug. As one of the leading vintage rug businesses in the country, Esmaili Rugs and Antiques encourages you to browse our remarkable collection of discounted Moroccan rugs online and call us for answers to any questions you may have regarding Moroccan carpets, materials, dyes and historical significance of individual rugs. Esmaili Rugs and Antiques, Inc operates in the Dallas Design District, Dallas’ affluent Park Cities location and owns a world-class assemblage of Moroccan rugs now discounted especially for our customers. Please feel free to call us today for more information about Moroccan carpets and other vintage or antique rugs we offer at competitive prices: (214) 651-7847.